LAGI 2019 Return to the Source invites you to create an iconic work of art for a landmark site within Masdar City, Abu Dhabi. Your artwork will use renewable energy technology as a medium of creative expression and will provide on-site energy production consistent with the master plan of the city. Masdar is the Arabic word for source. As the name of Abu Dhabi’s multifaceted renewable energy company and most ambitious low-carbon development, it is a reference to the Sun, the source of energy that sustains life on Earth, drives the wind and waves, and that over millions of years powered the transfer of ancient carbon dioxide out of the atmosphere and into the ground, creating a climate habitable to humans. Source also has meaning within the context of the Land Art Generator initiative, which was established in the UAE in 2008. 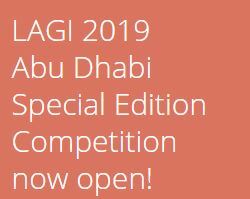 The first LAGI design competition was supported by Masdar and the award ceremony took place at the 2011 World Future Energy Summit, where eight years later the 2019 LAGI design competition is launched. LAGI 2019 Return to the Source invites you to present your vision for what public art looks like within the public spaces of Masdar City, the global capital of sustainability. The LAGI 2019 book featuring 50–60 submissions will be published with Prestel (a division of Random House) and will be released in January 2020 at the World Future Energy Summit.